Woke up Early and Needed to Pray. I was affirmed by Ate Grace Nono how important it is to understand Prayer as communication. You are not the only one who is speaking to the Divine Ancestors speak to and through you in Exchange. This morning I woke from a dream of many dishes in a sink needing to be washed. And my hands went to do the duty and the dishes became bodies and the sink became the ocean, and I was there scrubbing these bodies that were very much alive and I was crying and crying. I felt myself trembling and shaking, but I did not stop. I felt a deep responsibility to cleanse those bodies. They were being prepared to be used for a great rite. This is what I felt. I woke up and prayed. This is what I heard within me, in communication with ancestors. The reflection I have had with many of my closest circles is that we are in a time when because of widespread urgency from a very real imminent threat on our communities, with the election of Donald Trump, we are being called on around us and within ourselves to serve our communities deeper than ever before. It is such a complex feeling to look around you and see people who you could never get to a rally, or who never cared to talk “politics” finally show a sense of need to MOVE. For those of us whose life’s work has been connected to serving the dismantling of the system, decolonizing mentalities, resisting the structures of oppression that have always been in place, defending and protecting communities, speaking and helping others to speak who feel they cannot, healing those (including ourselves) who have been broken by experiences of hate, violence and inhumanity of this country – this time is very different- because this time we are not working behind a veil or iron curtain, this time those who could not see, can see because it’s being lifted so abruptly and loudly to the surface. And because of it they also are looking to us to lead. It is complex in the way that it feels so important to be there ready with urgency, to respond to that call to lead, and also, in moments it feels like we didn’t have to let it come to this, had all those that are waking up because of the very real violence and threat that is happening with immediate response in the streets. They are seeing what we as activists and community workers, just how much we were being fooled into upholding a system that has been built upon the back, the bones and the blood of the marginalized. I release this, because this is not the time to divide and stand in any resentment rooted in ego- this is rather the time that we have to look to one another and invite a more powerful unity than ever before. I take deep breaths and look to all those around me rising, and I hold together the pieces of my heart that have been aching and I speak, I act, I create from my deepest prayers of love, that I have always held and I seek to remind us that we belong to each other, and we have so much work we can finally do TOGETHER so that truth can ring the truest for all of humanity. This curriculum is for my organizers, because we need to be held to. We need to be healed in the deep processes of healing, we forget this so much sometimes. Check-In: What is something that you want to call into the space to energize and uplift our gathering today? Everyone will be invited to stand in a circle and have a piece of paper and a writing utensil behind them that they will use when called to. The idea is that we will be releasing the things that we are holding that keep us from rising fully in our work of serving others. Each stage will be different. There will be exchanges in the circle answering questions posed and making one word statements to be answered. When everyone has finished each person will go to their paper and write what has been released. Then return to the circle. The idea is that this is a circle of energy, so we need to make sure that we keep it up, that we cultivate in a way where nothing is dropped, but it is held, and then released onto the paper. I will help to keep the energy moving. With each question or prompt, someone will begin and the energy will flow to the left, closest to our hearts. Keep your answers succinct. **You may want to have them release this sound multiple times- throughout the exchange. What is a word that describes how you felt the moment that you found out about the results of the election? What is one thing that you FEAR most about the results of the election for your communities? What is one thing that you FEAR most about the results of the election for yourself? What is something that you have heard, or read that made you ANGRY in relation to the way others have been processing the results of the election? What is something that you have heard, or read that made you SAD in relation to the way others have been processing the results of the election? Who is someone you WORRY about because of the result of the election? In this round we will release fully, let it all flood out of you- sounds and word, but support it with movement continuously moving through the room as you speak what you are saying, let it support the release of your words. Let it be what it needs to be without judgement, be loud, RELEASE! And also use your body to help with the release, shake it off, rub it off, from your head to your toes. I will speak a topic and you will release. In this round we will create exchange. Carry your paper and your pen in your hand. We will be in touch exchange the entire time that we are in this round. Touch is a part of communication that we often leave out, this is an invitation to hold one another, to exchange energy that is connected to deep listening. Everyone pair up with someone in the space and you will,use a touch of intention to be a recognition of holding that person in listening exchange. Then you will take turns answering the questions that are posed. I will give 2 Minutes for one person in your pair to answer and 2 minutes for the other for each question. Do your best to not let go of each other, instead think about the exchange being one that is continuously holding. Make sure to thank your partner each time. What are the things that you feel you are carrying since hearing the results of the election? What are moments that you have witnessed that have shook the reality you were living before the results of the election? What are the large things that you are tackling in your communities right now that you feel are your responsibility and the heaviest for you to hold? The next step is to release these, I usually opt to burn them away, and let them be carried away with the fire. But I know this can be difficult with large groups, you also can tear them up and bury them- or instruct folks to do it on their own accord. We must look at these feelings, listen deeply to ourselves and understand how we hold space for each other and give to school other to help heal and fill from the places we confront and release. This portion of the work will be directed toward our understanding of self and where we hold ourselves as a community and individuals from rising. How can we check ourselves in this. Make examples of this in relation to the elections, how we as individuals and as a community are already doing these things on all ends, from Trump Supporters, to mixed responses from those against Trump results. Think about how our communities and selves are living in victim, and have been living in victm. How do we move to vision? Small Groups: Reflect on these concepts and ideas in particular around the happenings that have occurred in the last couple of days. We will do this in small groups. Share and write down what comes up for you as a group. Large Group: What are some things that came up? Some things that we have witnessed and participated in that keep us in victim? We are more equipped than we ever have been to make the change that will push forward the plight of our ancestors. We have the knowledge, the capacity, the technology, the numbers that make us no longer the minority- to finally make the change we wish to see. The movements have been growing and growing and the way we communicate, the way we congregate, the way we strategize has advanced more and more. We are creating consistently. We are remembering that before all else, we as human beings are creators and so long as we continue with deep intention, to move from victim to vision. Individual Time: Take a moment to write a declaration to yourself about what it means for you to move from Victim to Vision and hold space for others in your life to do the same in this time of needed Healing. Vision Boards are an activity meant to help you manifest images that will serve to remind you of your purpose and sacred calling, to bring to light what you wish to create from your imaginings and from your desires inside you of the life you wish to live. These are usually constructed on large paper, a board or can be manifested in many different ways- ie. Books, shadowboxes, sculptures, etc. You can use Magazine cuttings, images from books, photographs, print outs and can also create images through drawing or painting- the sky is the limit just as our visions of creating our lives are.. Image Materials- Magazines, Image Books, Scrap Fabric, Printouts, Photos, Stickers, Drawing paper, etc. Paint, Markers, Crayons, Pencils, Pens, etc. It is important in all facilitation to create the environment/ space to hold the energy that you wish to create. In this particular exercise the setup of the room is the most important. Take the time to form with the image materials that you have collected a labyrinth- a maze created for spiritual reflection and meditation (ie. a spiral pathway, or a maze within a circle in any configuration that you feel would be to the energy you wish to cultivate- example below). Set up the space with the other materials in the middle of the room. What role you play in your communities, how do you hold that role? Who is in your circle? Who are your mirrors? Who holds you? Builds with you? Creates with you? What skills and talents do you offer to the your family, your communities, to the world? What is the world you are contributing to that you may never live in, that will be our childrens’? Start by taking a deep breathe, in through your nose, filling up your lungs, and then breathe out of your mouth. And continue breathing in through your nose breathing in presence, and with an exhale breathing out and releasing through your mouth. With each breath release anything that is pulling you away from this moment. Continue in this pattern of breathing in presences and releasing distractions, attachments, and anything calling you away from this moment with your breath. Let yourself see how your breath moves through you, and let that breath fill you in a way that helps you re-member your entire self from your head to your toes and out your fingertips. See how your breath connects to your physical being, and how every curve, every dip, every dimple, every wrinkle on your body is connected to a history and a herstory, a legacy before you, a story of ancestry shaped by geography, by experience, by walks, by adventures, by battles and wars waged, by moments of stillness, and by prayer. Every part, every muscle, every organ. every bone, every vein, every cell, every particle was a gift from your ancestors. Connect this all with your breath with gratitude, with remembrance and then with a breath of intention gently let it float away, so what is revealed to you is your soul. See how your soul is also connected to your ancestry, a history and a herstory, a legacy before you, a story of ancestry shaped by wonderment, by belief, by heartache, by struggle, by joys, and by love. See what they lived out so you could become and what they dreamed you would become. See how your existence is a piece of something they prayed would live beyond them. Remember yourself so deeply in this way. Connect the dreams your ancestors dreamed in you with the ones you dream for those who will come after you. As you live out your Sacred Calling today. How do you serve? Who do you serve? What do you give to the world? What can you give in a deeper more intentional way? Know this “You are a living ancestor.” How can each experience serve your learning, your growing, your creating, your living? How can this very experience serve your learning, your growing, your creating, your living? What are you Reclaiming? What is the world you are contributing to that you may never live in, that will be our childrens’? What will you give to the building and creating of that tomorrow? Starting in this very moment? In this very room? Release, Remember, Reclaim- and let this be what heals you in your action and your creation. Who are you? What does it look like for you to stand fully in your power? How does it begin here? How does it contribute to the greater Legacy of who you are and will become for the upliftment of the future. Take 3 last deep breaths on your own time, and with each breath allow yourself to give gratitude, to return back to your body, putting back together every particle, every cell, every vein, every bone, every organ, every muscle, back into your skin. And whenever you are ready just start putting vibration back in your fingers and toes, take a stretch and then with the most ease and gentleness open your eyes. Take three more breaths in on your own time. And when you’re ready hold onto that vision and ever so slowly, ever so gently, open your eyes. State your intention as clearly as possible– in this instance to find the images that were awakened in their vision. o Decide whether you will walk barefoot or with shoes on. With bare feet, you can feel the texture of the earth beneath your feet and connect to its grounding forces. Begin your walk. The first step sets the pace for your walk. It can be fast or slow. Choose your intention for the walk. Are you being spiritual, reflective, mindful, playful, creative or something else? If you’re problem solving, your walk becomes a meditation when you surrender all your problems and just walk. Other parts of you have now a chance to process your request of a solution. o Surrender to walkng with mindfulness of what surrounds you. Let all else fall off your shoulders. Various parts of your being are now processing your wish for solution. Let it be and let go of any expectations. Let it all go. Surrender to the experience of walking the labyrinth. Find your answers in the Labyrinth. As you walk pick up the images that you feel call most to you that speak to your vision. Try to only pick up 2-3 to begin with and then on your way out of the circle 2-3 more. When you reach the center, pick up the materials you need and walk out of the circle. Accept the insights and gifts you may have received. Adopting a sense of gratitude will always facilitate resolutions. Offer your thanks for what you have retrieved. Find a space to Reflect, Pause, and Create. Find a space for self and pause there for awhile, sit or lay down if you feel like it and meditate or reflect. The main thing is to let yourself surrender totally to your inner process. It feels so good to have all the time you need. o Begin constructing your Vision Board with the collected materials. o If you don’t have a problem, question or quest for inspiration, just sit quietly and let things be. Gallery Walk- Group Share: Everyone will display their Vision boards on a chair with their statement of visioning and everyone will get post-its that they will use to write messages to those whose boards and declarations speak to them. Once everyone has gone around, go back to your board and give yourself a moment to sit with what has been given to you. And then come back to the big circle when I call you back. Big Group Reflection: How are you feeling? What is coming up for you? When I say the time is NOW it’s because this time is very different and for everyone who sees and didn’t before- we have work to do because many still do not see, and many do not want us to see. The time is NOW. If you are called to protest then fill the streets, if you are called to educate then gather folks to exchange in knowledge and equip them with the understanding they need to stand with youand share the knowledge further, if you are called to create then create so powerfully it will move masses, if you are called to give of monetary support then give everything you can to those who are on the ground serving, if you are called to heal- remember in the process to heal yourself, whatever you are doing- let it be with Love of our brothers and sisters and let it be to uplift us in a time when it is easy to feel like we are drowning- rise up, make change, we are together. Closing: The most powerful and healing statement we can offer ourselves is- “I AM” to close we will say one thing that we are taking away and say an “I AM” statement speaking the person we choose to be for this community and all communities that we hold space for and serve in this time of deep healing. ***This Curriculum has been put together to address the concern of speaking with a class that has both Trump Supporters and those from marginalized communities. I would begin before doing this curricula, if your class is strongly divided, by having students do a private reflection that you can take home with you and read that gives you information about how the students think of Donald Trump as President. Prompt: Do a free write about what the next 4 years of Donald Trump’s presidency looks like for your students. We are going to be discussing the foundations of what it means to be in a country that is based on the idea of having “Liberty and Justice for All” and what it means for a President to uphold and protect this. When you imagine a person who leads you, who protects and defends your rights and freedoms, who is a representative of who you are and what you live for, who would they be? reflect on what a president should be like? what type of person would your president be? We will be reflecting on this together. Small Group: Give each student this handout that helps to break down the role of the President and their ideal as to how they should lead. Large Group: Let them reflect individually with the hand out then bring them back to the big group. Have a large silhouette charted out and write what comes up for them. What came up for you? Share with us one of the most important things you wrote in your individual reflection. Have the students reflect on what platforms President Trump is standing on. Put up another silhouette and have the students share the way in which Donald Trump has and says he will lead. Answer the questions the same as they are in the hand out but directed toward him. What knowledge has Donald Trump show he has to lead this country? How has he/ has he not- shown love and compassion for the people of the United States? What would you want a president to feel about you, your friends, your family, your community? How is he standing up for all the people of the United States? How has he inspired courage from us? What has he said he would create to serve us to create progression for all the people of the United States? What example has he made? What actions has he done in his life, in the way he lives that he is leading by? Have the students reflect on this comparison of what President they want to lead them, and how Donald Trump is declaring he will and has already lead? What are things that they feel need to be addressed in his leadership and how can it be addressed? Activity #3: Dear Mr. President…. Take a look at the things you would want to ask Donald Trump to consider, to change, to understand in order for him to be a President that a young person like you could look up to. How do you think he should act, speak- what do you think he should create to uphold the LIBERTY and JUSTICE of all People? Write this letter as honestly as you can, in your own voice, tell him what you want from a president that represents you. Give the students time to write on their own time and then have them share with the whole group. Make room for discussion about the importance of holding a President, and all government and judiciary leaders to their DUTY of upholding the Liberty and Justice of us all. Talk to them about how important it is to act on an every day to also uphold these truths as a citizen of the US. How are we treating each other on a daily basis? How do we inspire fairness and compassion for everyone around us. Closing: What is one thing you are taking away? What is something that you will do to uphold Liberty and Justice today, in the way you speak, your actions or the way you treat someone? *Offer students the ability to check in with you individually, much will come up there after. It’s important for me to take moments of rest and distance from the intensities of living day to day. I have learned the necessity of replenishing my well and how crucial it is to seek to do this with the support of those who speak similar language of life and spirit with me, who walk the world with me in parallel paths of lightwork-purpose-sacred calling, and who seek to honor and uplift the living, creation, guides and the ancestors all around us. I take these moments to gather and reflect on learnings, to sit with my circles I have met and built with in my growing and ready them to be shared in prayer of words, action and creation. Last weekend, I exchanged in sacred sisterhood rooted in spirit, a tradition for Undas (Philippines Day of the Dead) I began last year when I gathered with sisters for ceremony of my first sacred Inking in Montreal. That trip was a definitive moment where I recognized sacred sisterhood surrounded my existence. This year on Undas my visit was to Toronto filled with light of ancestral spirit, sisterhood, children and elder wisdoms. I want to share 5 of these lessons that emerged to teach me and that I now carry as part of my deepest prayers, in this time in my life. 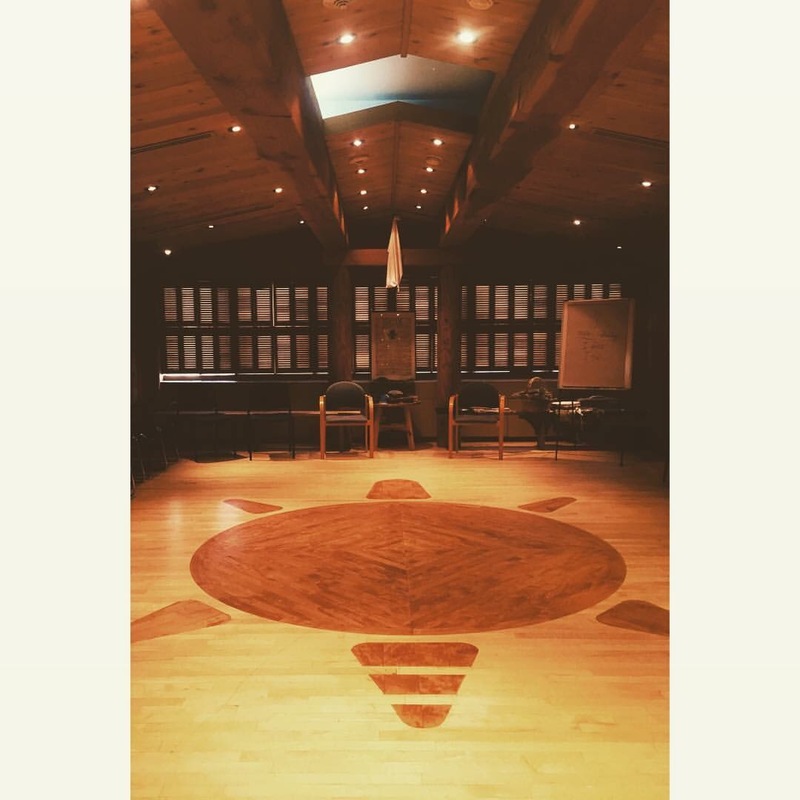 Our sister Maria who manages the Elder Lodge Dodem Kanonhsa'(Clan Lodge) in Toronto, Canada shared deep stories of her awakening, of her spiritual teachers and how she has recently been thrusted into her path through her dreamtime moving into her waking and her healing work presenting itself in a crisis of abundance. She has recently been feeling her power of holding healing, uniting, sacred spirit space and what her body has taught her in taking her time for her own healing. Pains, ailments, wounds persist when the healer does not re-member to heal themselves. She reflected on the ability to close the door (literally to her office) in moments of needing to rest, to say no with grace and to be at ease with doing only as much as her spirit can allow- which requires the deep listening. She taught the lesson of boundaries especially for those of us who do healing and guidance work and reminded us to take care of self when doing work with and for spirit. Not only can we replenish, but we can also process and reflect our relations and exchanges from spirit in a good way. My sisters Aimee and Jen of Kapwa Collective and our Ojibwe sister Amy trusted me the facilitation of holding ceremony for Sacred Dance intimately and with deep intention to hold one another in a moment of exploration. It was in this circle that we all learned how Surrender, Acceptance and Trust allows for the deepest healing. We each explored our separate and similar needs when giving in to a moment of deep connection with our spirits in dance. We explored the idea of fighting with our spiritual callings in relation to our physical lives, denying ourselves truth of what is being imparted to us from our guides and ancestors. We explored the affirmation of “Yes” and what it means to express our deepest desires without apology, but instead with excitement and confidence. We explored what it is like to accept healing from others and seek their support and affirmation and deny the healer within us to be trusted, to be given the power to give to self. And we explored the dance and how when you follow your path, the signs, the symbols, the senses of your being- you arrive exactly where you are supposed to. All these lessons rooted in Surrender, Acceptance and Trust. I sat with my sister Jen in exchange with Elder Grandma Rene Thomas-Hill at Dodem, who shared with us beautiful lessons of living. I expressed her my lonely heart as she felt heaviness there for me. She spoke to me of my light and how it was important for me to be that light even in the darkest places and how when I allow for that to be that I will find the light of others who are shining the same, and it is our job to help others find that light and turn it on in them as well. She said that it was okay for me to be different, it is special and that it is a duty to shine. I expressed to her moments when I have felt people leave me because of my being myself in this way, the image of light shining in the darkness and people approaching the light I shine, but then disregarding it. She said we all have to come to this in our own time, many are not ready to be with the light of truth, of spirit. But the important thing is to seek connection with those who I can call family, that I will know who these people are. she said, When I am without a sister I can adopt a sister, when I need a mother I can seek a mother in community to hold me, when I need a grandma I can adopt a grandma. And that they are there for me as I am there for them. My sister Jen added the presence of my ancestors and guides as spirit family always with me. Another lesson from Grandma Rene was the lesson of Healing others and ourselves as an exchange. She particularly spoke of the relationship between man and woman and the need for us to Heal eachother and to remember we were made to balance one another, to be in duality and exchange with eachother as the creator made us, like our two hands, two eyes, two ears work in tandem. She spoke of the need for us to help our brothers our men to cry to release and she told us ways to support this, that the mere action of creating a fist transmits anger to our hearts. She told us to teach them and ourselves that the opening of our hands, the holding and uniting of our hands the use of our hands to caress the head, to hold the shoulder, to embrace, to give warmth, these all are important for man and woman to learn to heal each other. She also said that we have a responsibility to one another in this way of healing because there is so much to rise from everyday. She emphasized self care, to do things that would support of spirits to be well. She told us to practice patience as a daily learning and give ourselves the time and space to listen to the messages that will come to us on our journey to put them together to help us find Peace in our living. She share morning saved me by sharing her stories to me as reminders (One story to share): She said she asked her own Elder in a moment of heartbreak by the world around her- “Apo-Why do we work so hard? And everyone has to take care of that place. Of what is ours to take care of. You are blessed for every seed we plant. you already care for so much. Because it can be passed down to our children. And celebrate it in deep prayer. I have daydreams of letting go of all things, of this life. And I feel so crazy, I feel like my loved ones think I am crazy. I lose my friends, I lose companions and students because I believe what I do about this world not serving us- too deeply sometimes. I’m not trying to shame anyone in speaking my beliefs, or making them feel guilty, I want just to contribute my perspective to the ability to make change for the betterment of us all. I give thankful for those who continue to accept me and to support me and to love me, for who I am, for my beliefs and for my work. 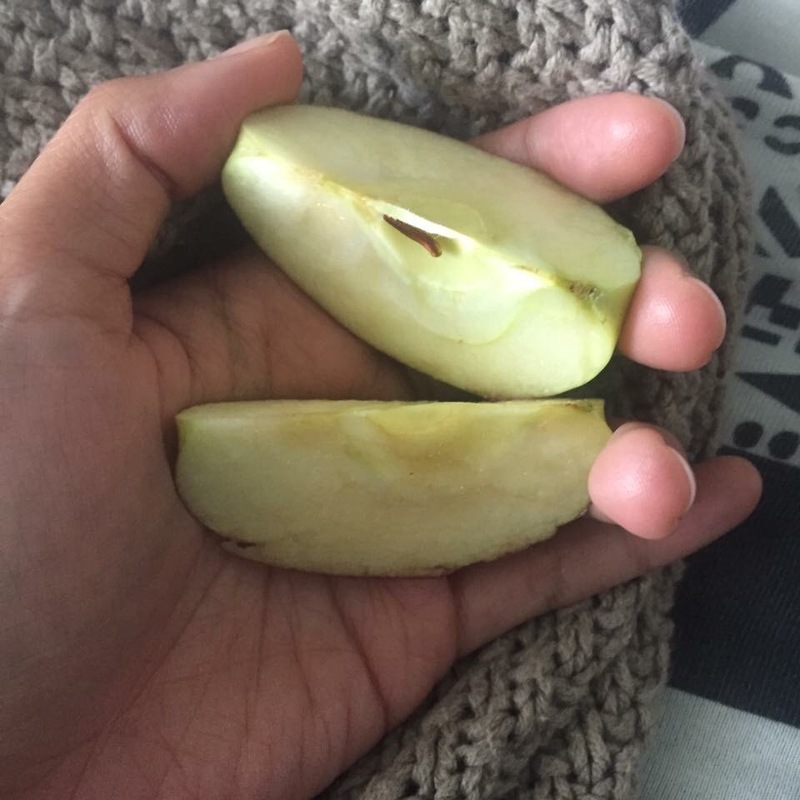 Eating apples on a Monday Afternoon, exchanging in understandings of the world. More comfort from my Elder. More love of lessons. More pray. They do not care about the water. This is a time of confusion. By the want for things that are rooted in vanity. More useful to Many People. I’m learning. Ever learning are all of us. And the deeper I learn with my spirit leading me, the more I am opened to all there is in life that is miracle and blessing in every moment. I am grateful for my sisters Jen and Aimee in Toronto who hold space for me, who support my rising, who see me, and accept me wholly as I am. I am humbled to hold space for them and lift them with my love and admiration in return. Many lessons to learn in future days together, I feel it, I know it and I am ever filled with gratitude. I woke up this morning and got to work formulating how to begin the journey that I know we all will be taking in the next 2 months to prepare ourselves and our communities to make a change. Here is a Curricula I have prepared to raise up our students and staff at El Puente. Please feel free to use it, shift it, grow it. Check-In: (Chart the answers) In one word or phrase Name your initial reactions/feelings after you heard Donald Trump was voted the President Elect of the United States? Many of these feelings we had this morning are rooted in the presence of FEAR- and FEAR arises because there is a threat, there is something at risk, because we may lose something, because we feel we have no control, because we feel victimized. This is not something to take lightly. This is not a moment to be complacent and go back to the lives we were living yesterday, this is a time when we have to begin looking at these issues at hand and understand more than ever how we as individuals and a community can stand up, and join the fight to stop them from worsening following the lead of a president who is openly and relentlessly racist-white supremacist, misogynist, homophobic, islamaphobic and ready to destroy any natural resource for capitalistic gain. We need to ready ourselves for the projected 4 years that our communities will have to fight for our rights, for our liberties and what already feels like for our LIVES. We’re going to take a moment to breakdown the specific issues at hand. What in US History supports this issue existing? What has been done so far to change this that you know of? What are questions you have that you feel you need answered to understand this issue deeper? These questions are ones that help us to crack the SURFACE of an issue, and we can deepen it and deepen it with intention. What did you all discover about the issue that you sought to tackle? What layers did you uncover? The beginning is the questioning, the action comes from deep understanding and aligning ourselves with others who feel passionate about the same issues as you. And following in this path and working in a way that you understand how valuable your voice, your actions, you movement to a movement, begins with how you orient yourself in your daily living. Throughout US history we have encountered these injustices and oppressions at extremes- genocide of Natives, Slavery, segregation, injustices around undocumented people’s, Black and Brown people being shot on the street, etc. But we have continued rising up. Show demographics of voting highlighting the high rate of the 18-25 Year old bracket having voted for alternative or the Democratic Parties. Really have this graphic sink in, If the youth of the US were the ones to have voted in this president we would have had a very different morning of November 9, 2016. LET THEM KNOW HOW THEY ARE THE HOPE OF THE FUTURE. It is important for you all to understand that we cannot see our power as a peoples ending at the Voting polls, people are already turning to one another in BLAME and divisiveness. We more than ever need to look to one another and unite. Your generation is our HOPE. We know that. Think about some positive things that are advancements from your generation and the time we live in that make it easier for us to Unite? What are your generation’s capabilities and what they have shown of their ability to create a different world on the shoulders of your ancestors’ plight? What are large people’s movements you have seen occur in the US and the World in the past couple of years and how are they still growing? 2. Black Lives Matter (A Nation Wide Movement) Talk about how tactics from Occupy were used in BLM and how they grew deeper, how there was massive movements happening simultaneously in the country and how it rapid response to these movements grew and grew. It unfortunately, because of the amount of killings of Black and Brown people becoming more and more visible became a norm for protest to happen, and thus brought us to a place where the police would also respond readily. 3. Standing Rock (A Global Movement) All on our land of the United States. Really bring awareness of the connection to this and our Native Peoples and how the call has reached around the world because we are facing a united issue around our Natural Resources all over the WORLD. Talk about the tactics that are happening around encampments and Warrior fronts, where Peaceful Direct Action is the center of this movement. What would it look like if all these movements stood up together all at once? Is that Possible? Why has it not happened yet? Share also the demographic of diversity in the US. And show them the class breakdown in the US and the disproportion of wealth. Guide them in seeing how many people do not benefit from Trump’s declarations of action for his Presidency- the connection across movements. Discuss this as a collective- How is this landing with you? What is Coming up for you? The students will be given a worksheet- with boxes breaking down parts of their life that will have them reflect on what makes them Valuable and Powerful and what support they have around them. People who you Love, that share your values, who you can Trust and turn to? What are the parts of your personality that you feel are most powerful? I am equipped with so many powerful skills and gifts to give to the survival and empowerment of my family and community. I’m also surrounded with some of the most brilliant organizers, teachers, healers, warriors and visionaries who I know are readying themselves beside me. My ancestors and the creator put me here because I am meant to serve and to rise here. I know they got me. What is one thing you are taking away from today’s circle and what is something you are personally going to do to inspire or make change after leaving today? I wrote this status in July. I am standing firmly on my stance of how I am carrying myself through this moment in time, on this land that I am a settler to. I believe my ancestors have kept me here for a reason. To carry out my role in a good way. I know how important it is, in this constructed world, to vote- policies and lawmaking counts, and also those laws are still and often broken and corrupted. I stand firmly in my own beliefs and actions that do not support this system. I am not investing my time and energy to tell folks to vote. I am inviting community to tables and exchanges that ask us to envision and implement another way of living that is just as possible as this constructed existence. As I’ve grown, I have removed my attachments from having to invest in the creations of this living that do not serve all of us as valuable beings contributing to this world. I’ve realized I’m willing to give up a lot to realize a world that I feel is worth living for, for all of us. I have given up so much already, and I also have gained tremendous peace of mind and heart. And have connected deeper in spirit because I understand that all of the things that I feel oppress me, are all constructions, that they were created by us as human beings, and maintained by illusions that have been reinforced by those they serve, which is very few. I do not want what they have to offer as the alternatives to my living based on money and false ideas of success and division of me and others. All this to say, I am using my energy to build with folks who are ready to create something different, who are willing to risk the comforts of this constructed living, which are really not that comfortable at all for all of us. 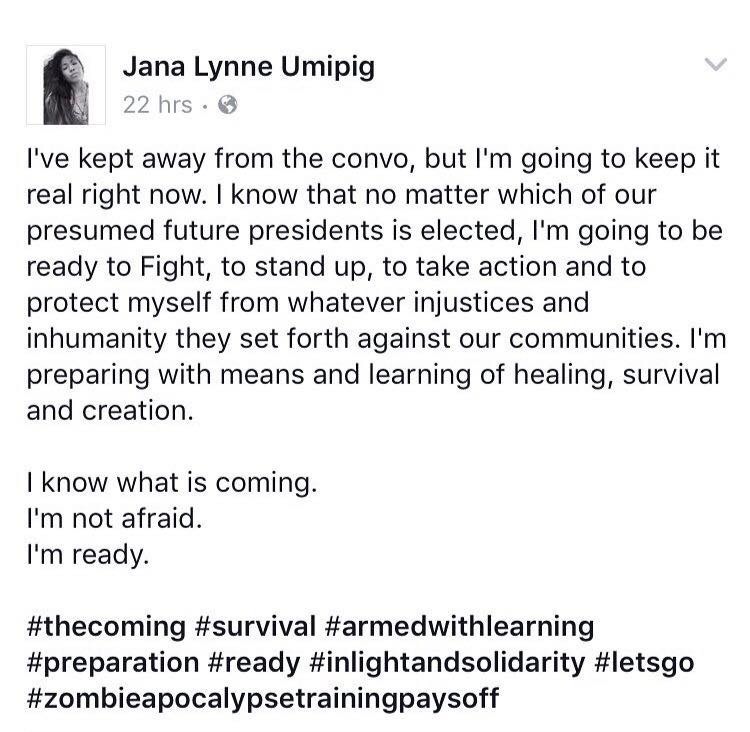 I’m ready to physically, mentally and spiritually stand up because I believe the time has come to do so- to fight for something different. That’s why I write my prayers, they are a reminder that we do not have to have the “truths” of this world be the only one that exists in us. Voting, is not going to determine whether we are all going to be “okay.” The words, actions and ways of living you put forth as an individual and with your communities will- the way we raise our children to believe and to treat each other will, the way we uphold our elders in their teachings of wisdom will, the way we see the importance of protecting our lands, waters and sky will. Those that are content with this world, that reap the most benefits from it, look to these determinants and believe deeply in the idea that this constructed world that upholds patriarchy, capitalism and white supremacy is the one that should be lived in. So their word, actions and ways of living as individuals and a community support that, the way they teach their children to believe supports that, the way they uphold their elders in their wisdom support that, the way they see the importance of destroying the land, waters and sky support that. My energy is being used here- calling folks to no longer buy into what does not serve us ALL. That all being said, I have not watched the debates, I am not investing in voting, and I am not saying anyone who does is wrong in their doing so. I just hope that with those votes we also prepare ourselves for whoever is elected in to not dictate all of what is possible for us. Begin by- knowing the survival skills of those in your community, understand your own knowledge of surviving, begin cultivating physical spaces that community can gather to seek safety and connection, live daily with gratitude and awareness of the remainder of our natural resources and take good care, take good care of each other, take good care of yourself. Let your actions be prayer. Let your creations be prayer. And let your prayer be powerful. I sat today in reflection with Serena Olsen practioner of Inner Dance about the experience of living in NYC while on my path of finding clarity and connection to a sacred calling working with and through spirit. New York has been difficult to root myself fully here- my spirit often feels exhausted, my heart often feels heavy and my mind often feels like it does not have the capacity to hold all the thoughts feel like they are racing. And yet I remain in New York because something inside me repeats the messages that “You are here for a reason. You need to be here. You belong here and have important work to do here.” I breathe through these messages with understanding despite the difficulties I have faced in my time here. Serena and I reflected on the construction of New York City and how it makes work with spirit so much more difficult. This is a place where the constructs are ever vertical, layering, building upon building because a majority of the vertical has already been covered. New York destroys memories with each construction, and these are raised vertically more and more with “success” in the monetary/capitalistic sense of what that is. Just the same the notions of goals, purpose and path are all vertically driven, to better you must be better than the other- competition and hierarchical structures are the way we are taught to function. There is very few spaces where we are looking to be in communal exchange and see the benefit of self being connected to the benefit of all others. The way we move is with the intention to move toward our “success”- and NY’s choices are rooted in just that- we say “Yes” when we feel achievement and success will be welcomed. We say “No” when the possibility of failure is present. And when we feel what has been constructed is not worth consuming or is no longer with the flow of the popular, the current, the mass appeal we build over it. We layer over what was once there. The ancestral land has a building built upon it and then that building begins as possibly a family owned shop, then becomes a start-up, then becomes a condo and a high rise and so on. Layering over and over erasing memories of what was once there. And the land continues to absorb the destruction, it holds all these memories, and we choose not to listen to its pain-we forget it’s messages and the way it holds foundational roots of ancestral knowledge and spirit. I see this being similar to why living with a goal of connecting to spirit is so difficult here. The same layering is happening to our beings. We layer over our wonder the conditioning, the conformity, the fears cloud the ancestral roots of our spirit that experiences with wonder that embraces all as same as self, that allows us gratitude and understanding of the importance of all beings and things in a place of service to each other. Layer after layer we become what someone, what the constructions around us, tell us we need to be. From childhood we are being taught in these metropolis environments to build upon the raw, wild and free self, ever in wonder- into individuals who are driven by “achievement” and constantly avoiding “failure”- based on conditions and standards that are made up, that are false. The journey I have been walking to go deeper and deeper, to lift the veils, the masks, the layers- to reveal the memories, the roots of knowledge that connects us to ancestor and spirit I feel is never ending and the more that I accept and say yes to that uncovering, the more I feel alone. I have experienced many of my relationships in the city end in a way where we experience deep rooted moments of spirit exchange, of healing and looking at traumas and wounds and then following that experience there is lack of investment to go deeper, to do more delayering, to uncover the roots and ancestral, spirit knowledge that has been built over and often destroyed. The deeper I have gone, the more fear and ego have persisted in their attempts to stop me- the messages that say “Don’t continue in that path, you are crazy, naive, unreasonable, you will end up poor, outcasted, be reprimanded, disregarded.” “The material and physical recognitions, the acclaim, the fortune are what we all want- the liberty to live fully only comes with investment in what has been constructed, there is no use in trying to have else.” Its everywhere I walk. Today I traveled through 14th St from 8th Ave to Union Square and I saw these messages everywhere and I heard the messages to enter stores, to be dressed in the latest apparels, to indulge myself in costly foods and treats, and even passing stores that were feeding the “metaphysical” were fully commodified- people paying to have more knowledge and more relics that connect them to spirit. The more we layer, the more we show our status of knowing, of having more material items, more means of luxurious living, having more knowledge, having more spirit. All the ego screaming at me. I tried to balance all the chatter that was speaking to what Serena described as seemingly an investment in the Crown and Root Chakra- the want to Achieve in the form of the Physical, but all that is in-between is being neglected and unbalanced. This creates the need for Financial Wellness to be a part of the balance of Mind, Body and Spiritually being well. And so in a place like NYC when we make decisions about what we want to create, who we want to grow with, what experiences we want to invest in, we are lead by these notions of achievement, notions of what you will gain that is going to feed the physical/material/ financial wealth of your being, and in a way that will serve your “success” and being “recognized” for it. And when things are limited to only a few, we want it even more, because it greatest achievement to have what others do not, and cannot have. I see all these creations that reflect human progress and advancement and we are not all given the opportunity or capability of accessing it, because that would not serve these constructions that have been created. Could you imagine a world where everything that was created was accessible to every person? How rich the human experience would be, how we could advance and grow and create so much more with collective, unified elevation and evolution, where no one is left to suffer not having what others have, what only a limited, elite, “successful” have worked to “achieve”? When we begin hearing the messages beneath all of these constructs, the deep under the buildings, in the ancestral land type of knowledge that says “What you are letting lead you are constructions, buildings, illusions, and you can build something else, something that serves us all,” it creates disruption and it is frightening and it feels like there are not enough who will follow in that- that are willing to abandon the constructs and create something new- and something inside of you says- “Maybe I’m not willing either.” And thus it continues. And is the reason I know I have had to release many relationships in my life, because I cannot accept that this world that has been created based on patriarchy, capitalism, hierarchical structures, guilt, shame, fear is the ONLY one that we can live in. I see, hear and feel past all these things the further I say “YES” to the path of spirit and ancestor speaking to me- when I listen to the trees, to the water, to the skies, when I listen deeper to the longing in people I meet to have a world that is invested in every individual’s belonging and elevation and ability to just live- and live well. A world that is invested in every person being given the right to food, shelter, and living life fulfilled- where every creation made by human innovation and progress is meant to be utilized by everyone and is meant to last because it is not just being constructed to feed constructions that value one persons ability to live fuller over millions and billions of others. I’m searching for community in this, in particular in the Pilipino community, but here in this city, it is so difficult to find the circles that are willing to say “YES” to the deconstruction, the delayering, the deepening of the listening and seeing that feels so unknown, to the invitations to not live in the constructions of division, of competition, of the want to achieve above the other. I’m searching for you to exchange with me in this, in this city. I believe that is why I stay. Because I believe that this place needs more individuals inviting us to listen to spirit. I have been cultivating my self practices for healing daily and have been seeking spaces to grow community that are in NYC, that I don’t have to feel so distant from, that will ground me in my path and elevate my existence as I become my greatest self and that I can exchange with in return, I’m still here because I believe in the possibility. I am here. I am listening. I invite you to listen and exchange and learn and practice with me. Thank you Serena for reflecting with me. This obviously is still being unpacked. And is continuously something I am struggling through. I am always open for communication, I am always searching for shared experiences and shared opportunities to overstand. Sunday, October 16, 2016 is the one of the last days of Serena’s visit offering Inner Dance experience in NYC this run before headed to the Bay Area, West Coast and then possibly returning back to the Philippines. Don’t let cost turn you away, she is offering discounts for all to be able to attend. Remembering it is all energy exchange. 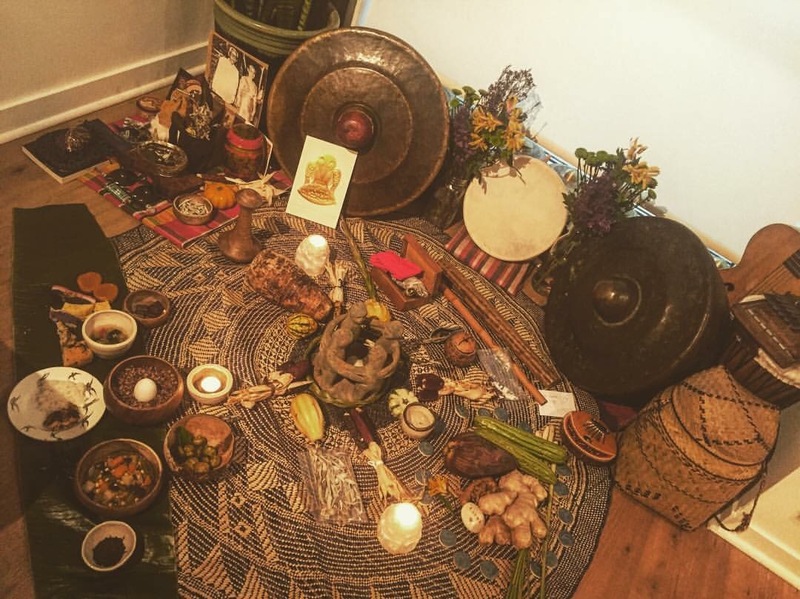 I am currently working on bringing others who I have exchanged with from across the globe to teach us their spiritual and ancestral practices rooted in Pilipino cultural learning. All are always welcome, the invitations are continually meant to bring us closer to each other in a way where we can see beyond a world that has been constructed. I hope to continue peeling past the layers. My name is Jana Lynne Umipig, daughter Godofredo and Rosemarie Umipig, granddaughter of Anacleto and Cristina Umipig and Santiago and Nena Caldetera. My family comes from the regions of Ilocos Sur (Sta. Maria) and Ilocos Norte (Pagudpud). I am a proud yet humble Core Member of the Center of Babaylan Studies. In our time gathering for the Third International Babaylan Conference- Makasaysayang Pagtatagpo (Historic Encounters): Filipinos and Indigenous Turtle Islanders Revitalizing Ancestral Traditions Together many lessons were amplified and much clarity was brought to the surface to guide us all in our individual and collective paths connecting to spirit and honoring our ancestry. The most important of the roles I was called to rise in during this time, was the role of Witness, shared with us as a sacred native tradition by our hosts from the Coast Salish, Skwxwú7mesh Territory on the Sunshine Coast of Vancouver. In my understanding of the tradition, when tribes/villages gather in a large convening there were witnesses chosen from each village who would bare the responsibility of observing, listening and holding space for the messages and truths that would unfold during the exchanges that would transpire during the time the tribes/villages were in communion with one another. At the closing of the convening they would be asked to share with the elders of the tribes and with the community in attendance what they gathered from their deep listening. This is the written account of my reflections on a moment in this living where I was given the invitation and duty to Listen deeply. The first days at Camp Elphinstone were filled with so much anticipation of our guests, with much movement to make every detail attended to, to the best of our ability as an organizing team of the Center for Babaylan Studies and Kathara Pilipino Indigenous Arts Collective Society. I followed with humility the lead of my sisters and brothers, and I sat with them in deep gratitude for the attention to those details as we stayed up late into the night on that Thursday evening assembling nametags and satchels of seeds to gift as offering to those joining us in the next coming days and preparing the registration materials to welcome our guests upon arrival. As a Core Member of CfBS, I feel my witnessing began the moment I was accepted into this circle of Sacred Work. I want to take this beginning moment of my report to recognize my sisters and brothers and what I learned from each of them in our communal work of manifesting this convening together. In reflection of the teachings from our Kapwa in Kathara I thank Claudine for her teachings of Lifted Energy, the way that she awakened us all with her presence and warmth. Like the lessons of the sun she was continuously giving of warmth, of liveliness, of light from the very last moment of her departure we all felt the rising of our spirits as you rose in yours with every exchange. I thank Babette and Sobey for the teachings of respecting sacred exchange; they taught the arduous and important work of building relationships with our Native brothers and sisters and how much humility is part of every encounter. Sobey taught me the importance of patience and steadiness in communication and was balanced by Babette’s way of dancing in exchanges, leading with her heart and with her mother womb. I thank JR for his leadership and his joy. JR taught me presence, particularly the importance of being in presence of self for the support of others – he walked with us every step of the way and was often the key communicator between us and the community in Vancouver. Because of you all, I left the conference truly understanding a call to reconcile a relationship with the Natives on the land I settle on in New York, and what it will mean to begin that relationship in a good and honorable way. The teachings learned along the way from my Core Family are so tremendous. The largest of those learnings is how there is a life investment when you exchange in creating relationships centered on spirit. I had not lead my relationship-building so intentionally in spirit until I was invited into this circle; it was something that was unspoken of, but with my sister of CfBS that is what roots us in our Sacred Work together – our deep commitment to the upliftment of our spirits in connection to the spirit of all. Ate Maileen, I am always in awe with the way you see moments with Light. I learn from you the beauty of observance and how profound it is to focus on awareness of what is conspiring around you. I believe this is where your mastery of photography comes from; it is rooted in a deeper way of being humble to moments and being silent to what you see, it is prayer in observance. Ate Inday, I am in awe by your way of moving with grace, just as your name amplifies, I learned from you to listen from within and to do this lovingly and with patience. Your Love and Care is so profound, they illuminate and bring clarity through your words, actions and even stillness. I am humbled to have you act as a guide and model of upliftment in my life. Sis Jen, you have taught me the truth of feminine power, the way you hold space with the desire for the goodness of all, and how you give so tremendously of your wisdom with each exchange. You are fierce in the way you hold yourself in connection to spirit continuously. I see you move like Water sister, gentle and healing and so powerful in this way, I learn from you to be a Warrior Womxn always rising. Sis Aimee, I am humbled to have you in my life and to follow you in your tremendous leadership – I want to honor you in the way you were the weaver of our entire community in this process of creating this convening. You held us all accountable to roles to lift this sacred work and you always did it with such genuine joy and with so much wisdom of organizing. I learn from you to Lead, and I am so thankful for how you gave of your entire self to all of us in every breath you exchanged. Ate Lily, thank you for being a gentle storm, that teaches me to be brave in my movements and to do so with ease and grace. I learn from you the power that can come from compassion and Love being held in every intention no matter how it disrupts and creates chaos. I learned from you that at all moments we will return to Love if we push forward with that intent. I learn to stand up for what our heart speaks to us and to see the beauty in the challenges that we rise up against. And Ate Leny, I learn from you to live in vision. I listen deeply to the way you SEE. You are a seer, you understand when we lose sight, you pause when we get caught up in movement and you invite us to join you in each moment to move with more awareness and knowledge. I thank you for this, and I thank you for seeing all of us on our paths toward and in seeing us, connecting us together, initiating unions that are rooted in spirit and ancestral learning. You are so powerful. I begin my reflections in my witnessing in this way because it is important for me to recognize the individuals who answered a call from spirit to create our convening. It is important for me, because we did not get a chance to do so in the presence of those that attended the gathering, to honor those that took care of every detail before, during and are still working to take care of details here after. We were faced with many challenges,and because we were the powerful collective of human beings that we were, who volunteered to rise in this sacred work together – we, together, were able to transform each moment into lessons. These individuals throughout the conference held space for almost 150 other learners, giving of their time, energy, presence and spirit to care for those we invited to walk with us. 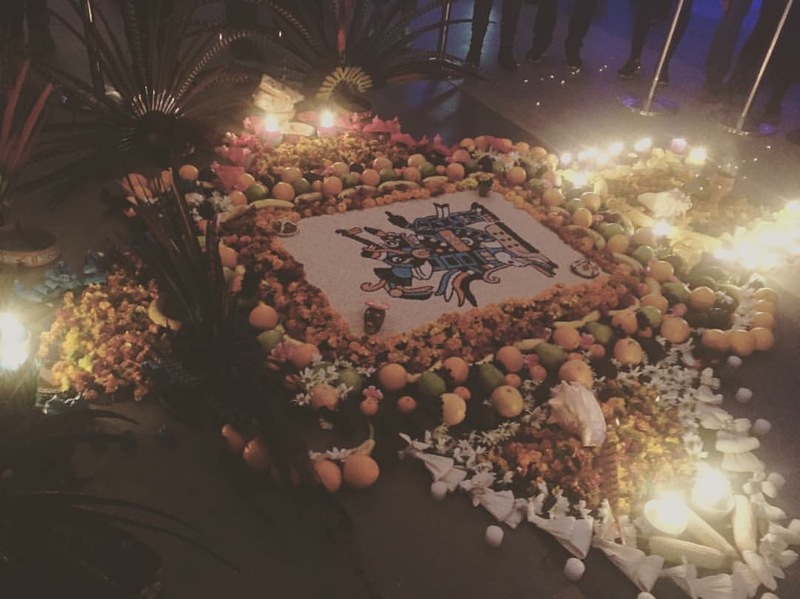 It is always unseen how much is done to create these types of sacred spaces, and I am humbled to have borne witness and to have contributed beside all of you in this creating. Now I reflect on the conference in whole and what messages were heard and processed in my time as a Witness. Every lesson I share here, comes from the teachings of all of you. Many of you sat in exchange with me and I believe did so in connection and in echo of others in our community. I received your sharings and I listened deeply to what lay beneath these messages and I am still in this moment listening to what was shared with me and I am still processing deeper and deeper what is beneath the surface words that were exchanged. Every lesson I share here comes from our communal teachings in exchange. I pray you all know, that it has been difficult to write these messages, because I have experienced, even post conference, how many have left not looking deeper at our learnings with Love and humility. The greatest message I learned in our time together was that “We are all learning. We are ever learning. Be kind to yourself and to others in our learnings.” I hope this message can echo throughout my reflection and my sharing for myself, for you and for any other individuals that come to your mind in reading my words ““We are all learning. We are ever learning. Be kind to yourself and to others in our learnings.”. In our journeying through this life, we can get caught up in messages of colonial mentality that urge us to KNOW. The purpose of our gathering was embedded in its title: “Revitalizing Ancestral Traditions TOGETHER.” Colonial teachings create emphasis on the INDIVIDUAL, and raise our ego to take precedence over our humility, our gratitude that allows us to find continuous wonder and gratitude for our living. As Greg Sarris shared in his talk: “Wonder makes us humble.” How unfortunate that we have forgotten so much of what it means to live in wonder. We are all still learning and we will ever be learning about this life. Now is a time to be in wonderment as we have all experienced deep exchanges and newness in our circles on similar paths toward knowing spirit. Lessons learned to begin: Be humble in your misunderstandings and the misunderstandings of others. Draw away from shaming yourself, from shaming others – take moments to express truth as you have learned it and offer it to others with humility; those teachings are universal learnings that were meant to be shared with care and not with ego. We need to work more to invite each other with compassion into conversations of learning and to approach one another with the intention of Love and the genuine want for us all to be better in our paths and to speak and act in a good way with all our relations. As the Core has reflected on since our gathering, we did not prepare the participants we invited to gather fully on how to enter exchanges in ceremony. On our first day together when we were leaving to the water, I invited everyone to make their walk to the water in silence and to allow ourselves to fully “Arrive.” Invitations are just as they are, they are not mandates, they are gentle reminders to be aware of how we treat our journey and our exchanges. I have learned in our gathering how difficult it is to break away from colonial rituals. We are more accustomed to these, than those of our ancestors (the reason why we gather, to remember), and many times because there are insidious attachments to Colonial rituals we are not aware of the importance of being mindful, or how impactful it really is to be present to experiences with all our senses, especially in connection to ceremony and ritual inviting spirit. I felt the uneasiness of those present on the shore, many were anxious, many were unsure and confused, many felt the want to invite others to act and be present in the ways they have learned, and drew back. I breathed through my own moments of wanting to tell folks to be quiet, to listen. I felt my own discomfort and breathed through it, pushing myself to be present as the rain fell on us. 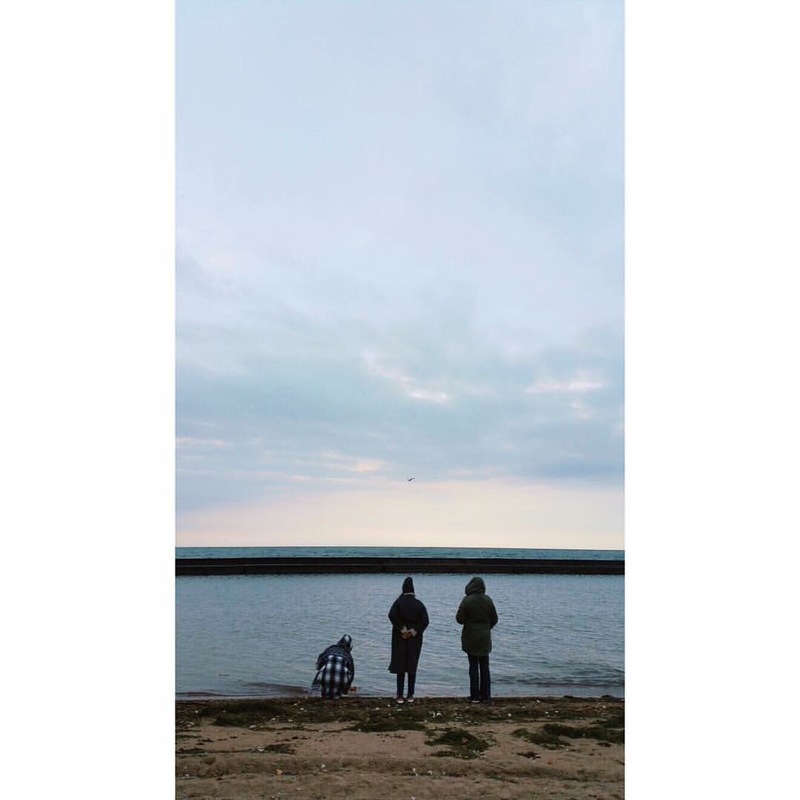 I watched as Babette and JR submerged themselves into the water in service of ceremony, I listened deeply to Lagitan’s song and the Song of our ancestors and I saw many spirits in the fog waiting to be welcomed on to the shore by Chief Ian and Mandy. I heard them say “We are here. We have arrived. You all have not arrived yet.” I felt the same, we all had not arrived fully yet to this moment together. In that moment I recognized that it is not us who invites one another to be in these spaces, it is our ancestors. They speak to us to commune in exchange of understanding this living, they ask us to impart their messages and teachings in every moment, they invite us all to experience together because they understand the power in this. Our ancestors smiled the moment we heard their invitation to gather. Ate Leny and JR could not remember who invited who to create this conference, it was our ancestors who invites us to create powerfully TOGETHER. Through the canoe ceremony- we asked permission in exchange through song – and song being the voice of ancestors vibrating through our vocal cords. Song is spirit expression just as dance is. And the asking of permission was elevated in this way. We ask permission because of a respect for one another, because of an understanding that we all must be willing for genuine and equitable exchange to be upheld in our communion. This is not how we are taught in colonial teachings, it is often more about what we receive for ourselves, how we as individuals gain, what the value is for self before others. Our ancestors ask us to consider, to have recognition and to hold the betterment and goodness of one another in every exchange. Ate Diveena spoke of the way the world we live in has been steeped in Colonial teachings, but we have our ancestors within us, around us, above us and below us, and they are continually reminding us in messages that we have the power to live in a way that is good, that is just, that is connected to them and Great Spirit. It is not easy to walk the path of re-membering and re-becoming. The learnings of what it means to create home again on this earth when we have been told that it is not ours to live on, that it comes with a price tag- that the lands our ancestors walked on cannot be cared for by us, but it continues to be destroyed by others who have purchased the right to do so, the land cannot be exchanged on in spirit by us because of our acceptance of colonial doctrine and ways of living. These false teachings have told us to fear and that we cannot act upon what we learn by and of our ancestors that the land belongs to us, that we belong to the land. “300 years of Church and 30 years of Hollywood” as spoken by our guest from the Philippines- their teachings tell us to be divided. But our ancestors are continuously trying to remind us and our hearts are continuously reaching out to re-member. After Canoe Ceremony, I took a moment to ask permission from the waters to be with us, central to our Dambana (altar). I asked Chief Ian, how to approach the Water in a good way, to receive her presence and listened to her welcome me to gather a part of her to bless our sacred space. Water is sacred. Water is life. He helped me pray and I listened to her give to our gathering. The water spoke throughout our time together, she was helping us to clear and cleanse. The rain fell throughout the days we spent on Mt. Elphinstone, another invitation from spirit, from water to be present, to be aware, to find moments of stillness and to see what needed to be made clear. Like the Sea Lion made from fire and cedar and submerged in the waters as told by Chief Ian in the creation story of the Coast Salish- we were being submerged in waters of spirit throughout our time together. In the Queer, Twin- Spirit Circle gathering Ate Lily also spoke of the pains of not having a village to usher us in our healing.” I reflected on this in our finding of one another- How we have found circles to hold us in our healing, to share in strength with, to lift sorrows and traumas with, to remember compassion of self and other with, to rediscover joy with in laughter and love- I heard in this gathering and in our entire convening that this is our village and this village will grow, and as we grow, we will learn and know each other- we will learn and know of ourselves, we will free ourselves with every exchange, we will plant seeds for the future. Grief and sorrow is beautiful when held in communion. When we bare our broken souls to each other. We find in our Kapwa pieces of ourselves being filled- every crack and hole being filled with Love. And also I learned and heard that we do not only have to Mourn in our process of remembering, because every time we hear, and see our ancestors and we reclaim their teachings in our lives they celebrate us. “We are the dreams our ancestors dreamed would free them.” A message I have repeatedly shared in my artistic expressions, a message of universal truth I found within myself in my exchange of learning with others. Our ancestors breathe, speak, cry, stand, walk, run, dance, fly through us. This brings me to reflection on Saturday and what it meant to be Witness in that moment of living and experiencing spirit together. I have been gathering and learning and processing and crying and feeling so moved by what took place around our Dambana at the conference. I look deeply to Lagitan, to Nati and to our elders for guidance as all those who were present were opened up to a tremendously transformative experience. We all left that moment changed in our path toward remembering and communing with ancestors. The Dambana, the place where we invited our ancestors to join us in convening, where we laid down medicines from our Philippine Traditional learnings and unified them in bridging with our Coast Salish relatives. I recalled the care that was taken in configuring that sacred space, in an honorable way, in a way of following what has been learned and hoping to deepen that learning in the future. Such a powerful exchange I was honored to have with Biyaals in silence, in patience. And as she smudged with the room in the beginning before anyone else stepped into the space, I knew powerful happenings would emerge from our gathering. The Dambana itself was a representation of a bridge we were building not only between Indigenous peoples, but between us and our ancestors and Spirit. I sat with these messages myself throughout that evening as I sat in reflection with our community in intimate spaces and I recognized for myself how much we all may have received these messages in ways where we blamed, shamed and condemned ourselves in the presence of community. I don’t believe that this is how these messages and learnings can serve us. To Listen, to fully and truly Listen, takes patience, it takes deep compassion, it takes us moving beyond just feeling. Because we have not been taught to do this, we may not have heard what the root of what was communicated to us was really offering us to move forward with. I invite us all to receive these messages not with fear, not with ego, but rather to receive them with Love and with Kindness. There was so much I heard throughout the conference of judgment of one another and of our selves. I heard recognition and claiming of division. I heard messages of shame and feelings of unworthiness. These truths are not ours. “We are all learning. We are ever learning. Be kind to yourself and to others in our learnings.” We must fight for Love and Kindness to persist. Even through spirit and how we commune with them. We must do as Water and Fire do, clear things away and allow for us to truly see. To Listen. To recognize what roles we play in honoring the life we have been given and the many lives that are living in communion with our own. Prayer is important, that is the exchange between us and spirit and the way we communicate to them that we are listening and prayer comes in many forms. We all have power within ourselves and gifts that we carry that we must learn to use these gifts as prayer and live with all our relations honoring what they contribute to the whole in good and honorable ways. This is what I heard in the messages. And it all came back over and over for me about the value, the importance and the purpose of learning. Seek teachers, see the teachers in each other, share as a teacher to those who appear in your life for learning exchanges. And know that these teachers are not just people, they are the animals, they are the land, they are as I spoke of earlier, the Water, and the Fire as we heard throughout from Lagitan and Corrine and its many keepers, our teachers are all around us, and they are within us. Our teachers are also our children- we should look more to them to remind us what has been forgotten and we must protect them in their growing in this world so they can hear spirit as clearly as we are working to remember how to. It is our duty to see them as our teachers and to listen to them as we listen to the Water, the Earth, the Wind and Fire. All our relations are rooted in learning, and those learnings are what will grow us, and will propel us in living purposeful and full lives, guided by goodness and Light. I give thanks in closing to our hosts of the Coast Salish, Skwxwú7mesh Territory. We follow in your teachings as we are all still learning. I thank Chief Ian and Mandy and their relatives for receiving us with joy and for seeing the connections between our people right down to the fiber of the cloth that we exchanged with them similarly draped over our hearts and uplifting our minds. I thank Chief Willard for sharing teachings of justice and honoring and what it means to live to fight for your peoples and your traditions that connect you to ancestors and spirit for the well being and protection of all our relations. I thank Biyaals for being a deep example of teaching and bearing truth like the Bear and balancing it with gentleness and Love like the Deer, it was powerful to see the exchange between you and Lagitan in holding all of us and holding spirit. I hope we all can reflect in a way that what transpired in our gathering was an invitation to continue in our learnings. This conference, this convening, this gathering- was always about learning. We heard the importance of learning from our teachers and most importantly we heard it within ourselves the moment we made the commitment to attend- we all arrived in common place to Learn. You cannot own the land. You cannot own the waters. You cannot own what is wild and free. Reaching out to community for monetary support is something so humbling. It could easily create insecurity and feelings of discomfort, but for me that is not the equivalent of the humility I feel. To me, the feeling of being humbled is a deep gratitude to those who see a sense of worth in what I live in this existence and it doesn’t need to be monetary exchange of course not. But when someone offers you monetary givings it is giving of a piece of what sustains them in this physical world given to support you in yours. Their giving to you does not hinder them, but rather as they give there is recognition that they your work in this living to be more valuable than a dollar amount- that it will bring returns for something more life fulfilling, nurturing and healing than the constructed value of a dollar or two or ten or fifty or a hundred. I have always had the mentality of “If I can then I will.” A mindset that has allowed me in the past to aide my own friends for a meal, or for a place to sleep, or for an opportunity to have a day or evening to enjoy an activity of leisure away from the stresses of being without money. “If I can then I will,” helps to be present in ability rather than living with anxiety and depression of scarcity, and it invites others to give in exchange of what they have to support what you may need to elevate. Any work I do in this living, when being offered a monetary check, is received with thanks that the energy and time and knowledge and talent I have offered gives to emotional, spiritual and mental wellness of others and in return my physical life wellness is provided for. I say all this to offer a shift in the way we think of our monetary exchanges. I say this to create more exchanges of acceptance when someone offers you a monetary exchange and more willingness to give of monetary exchange. I say this so artists and cultural workers and others who work so hard and give of their talent and of their living for very little monetary exchange can feel the peace in truth that they can ask for more. I say this because o believe this. I say this because I have been humbled by a current experience of asking and receiving in abundance. I say this with deep, genuine gratitude. I seek to live forward with the support given now in this moment of need and throughout my life past and future- to create through my sacred calling, holding true to my value for self and the world, and honoring the value of others in exchange spiritually, mentally and physically inclusive of monetary exchange.